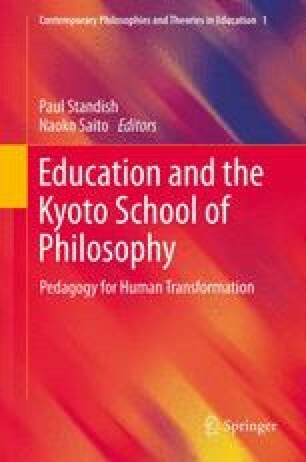 This paper discusses Zeami Motokiyo’s philosophical framework of “exercise and expertise”. Zeami, a master of traditional Japanese wisdom (1363–1443), wrote theoretical texts on theatre performance and “Keiko”, which translates as exercise, or expertise in the sense of lesson, practice, or discipline. Here I draw attention to the relationship between three processes described in his texts, which refer to the development of the skill of the actor: (a) the acquisition of skill, that is, the process of construction; (b) the unlearning of skill, that is, the process of deconstruction; and (c) the birth of renewed skill, that is, the process of reconstruction. According to Zeami’s text, through this process of reconstruction the actor acquires the perspective of DOUBLE EYES, which refers to the birth of new awareness. I take Zeami’s framework to offer a way of rethinking our current understanding of development and expertise. Postmodern philosophy is often considered to be the philosophy of deconstruction. The value of “Progress” has been completely undermined. In light of such deconstructionist thought, we have to look for a different understanding of “development”. I present Zeami’s insight, and the idea of ‘double eyes’ in particular, as one possibility. DOUBLE-EYES is a defining concept in Eastern philosophy and encapsulates the richness of Zeami’s theoretical text.